There really is no limit when it comes to smoothies. Yes, and they’re good too. Really. I’m not kidding. I made myself one yesterday. Ain’t it purty? In a blender add the banana, strawberries, yogurt, and orange juice. Blend until smooth. Add the flax seeds and whey, blend until evenly distributed. Pour in two glasses and enjoy! Makes 2 smoothies or cut ingredients for a solo one! Change the fruits to make a whole new kind of smoothie. Thanks, Heather for sending us those! I really like mixing my homemade yogurt or kefir (kefir is a lot like yogurt, just a little runnier) and a variety of frozen fruits, a tiny bit of vanilla and a few drops of stevia to sweeten. Blend it up and you’ve got breakfast or a snack or a side dish at lunch. And I know you’re dying to find out how I made my spinach smoothie…’cause you really want to hop right up and make one yourself! It was a banana, and apple, a big handful of spinach leaves, about a half cup of water and a few drops of stevia. Trust me, it mostly tastes like banana and apple. You can use any kinds of greens – I just happened to have spinach on hand. These sound good except for the spinach one…that just has no appeal to me whatsoever. Thanks for the spinach smoothie idea. I tried it and we all LOVE it! Great ideas for smoothies. I need to get me a coffee grinder so I can grind up the whole flax seeds I have. I bought some milled flax seed at the store yesterday and I used some in some whole grain pancakes I made this morning. The pancakes turned out wonderful! Can you explain the difference between kefir and yogurt? And is one better for you than the other? I’ve done the green smoothie before; not bad at all! I put a dash of cinnamon and a little splash of vanilla extract in most of my smoothies. A few packets of Splenda too, since I am type 2 diabetic. Smoothies are a good way to use extra fruit. I peel bananas and put them in the freezer when I have too many. No ice needed, and it is all ready to plop in the blender. We add raw egg yolks into ours! There’s no taste, just lots of great nutrition! St. Patricks day smoothies will be a HIT! Just a FYI…after I purchased a huge bottle of stevia liquid, I found this information on it…wish I would have known, so I’m just passing along the info! On stevia: white stevia powder and liquid stevia are heavily processed and do not remotely resemble the native, natural plant. Moreover, stevia (despite its acclaim in low-carb circles) was never traditionally used as a sweetener; rather, it was traditionally used as a contraceptive by indigenous South American peoples. Very few studies have been… See more carried out on stevia, and those that focused on its purported contraceptive effects have been contradictory: some say it’s contraceptive, others don’t. Interestingly, the same factors that make stevia sweet are those that are thought to have contraceptive effects. In the end, I always fall back to tradition and food history: in this case, stevia never held a place in traditional societies as a sweetener. That said, if you still want to use stevia make sure to only use the green stevia which is simply the stevia herb powdered. Do not use processed stevia: white powder or liquid. Be carefull with raw egg. Don’t know if it is true but I hear if you wash them before you crack them it reduces the chances of getting sice. Eliminating the chance of and unseen feaces being on the eggs. and 1 or 2 frozen bananas. Ice crush these and then puree it all. YUM!!! We LOVE this here at our house!! Once I was making a green smoothie with bagged kale. That stuff was bitter! So I looked at the bag and it was actually mustard greens. I hate wasting food, but there was no salvaging that. Low Carb diet is really the best diet if you want to reduce weight and also to maintain a healthy body..,. I tried your Ultimate Smoothie and loved it! I’m just curious….why do you put whey protein powder in it? I bought some and used it, but I was just wondering. 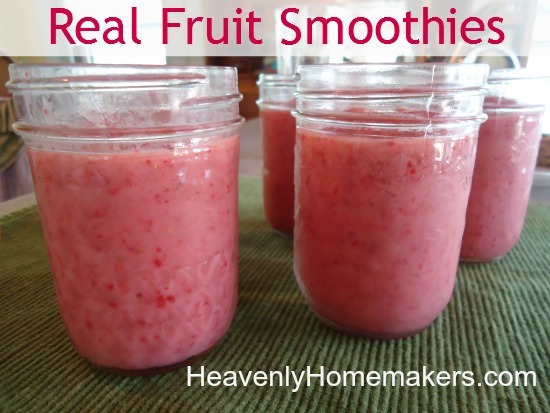 Here’s a smoothie recipe that my kids and I just love. I sometimes add in 1 Tbsp of wheat germ or flax. We usually each get about 10-12 ounces of it and often I add in chia seeds or flax seeds. Pears tend to really cut the bitterness of the greens. The Ultimate Smoothie was delicious! I make a green smoothie almost everyday. I use frozen strawberries, blueberries, banana, celery, mango, broccoli, spinach, squeeze some lemon juice out of a lemon, dump some yogurt in and add some apple or orange juice. It’s fantastic. I can’t get kale around here, otherwise I’d use that too! Pineapple is just starting to come in season, so I’m looking forward to putting some fresh pineapple in it too. My son LOVES green smoothies. We use spinch or chard from the garden. I never let him see me put the greens in because he would never drink it! We’ve been getting into making smoothies or fresh juice every morning for breakfast. We recieved a juicer for our wedding and it got us started on our determined quest to eat healthier. Recently we got a blendtec blender too (Smoothies, homemade almond butter, food processor, even made my own oat flour from oats the other day! )I can’t say enough good about how they have really cchanged our lives! anyways… juice and smoothies- Ahhh… sooo much more energy than coffee that I actually have pretty much let go of coffee which I use to drink practically gallons of every day. I feel WAY better, have lots more energy, and get all my fruits and veggies in at breakfast! Anyone freaked out about juicing or making smoothies with veggies… I have some advice which makes them SO good! (I was initially “freaked out” at the thought of them too!) I have what I call 2 secret ingredients to take away the blah veggie taste- Lemons (Or organic lemon juice concentrate stuff) and fresh ginger! The above is over half veggies… but by stirring in a splash of lemon juice after its juiced (Or juicing a 1/4 of a lemon in with it)you would seriously NEVER know it had veggies in it. It does what I call “citrifies” it because of the lemon. So then pour it into something where you cant see the green color, and drink it and I PROMISE you’ll never know it has veggies in it! You can even stir in some pro-biotic yogurt for a creamy treat thats super good for you too! the above recipe (I never measure… its a “dump it in” guesstimate thing) is our typical breakfast. And what has made ALL the difference in it is the lemon and ginger as far as taste goes. They are subtle but really mask the veggieness of it and make it soooooo so good! and my latest- throw in 1/2 of an avocado to above recipe. Sounds TOTALLY weird… i had a hard time doing it thinking I would mess up my smoothie. BUT… it makes the CREAMIEST smoothie ever and avocado is so good for you! It really is a “mind over matter” thing getting use to the veggies but drink it with your eyes closed and try my lemon/ginger trick and I promise you’ll be amazed ;) k… pretty sure this is the longest comment EVER… haha… but im obsessed now with my smoothies/juices!